While most child actors run the risk of becoming a fleeting memory, the outlook for video interviewing is incredibly bright! 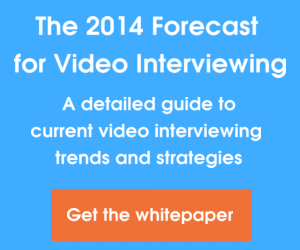 In fact, the free to download whitepaper reveals the many ways employers will harness video interviewing in 2014. Readers also get an in-depth look into which companies and industries will prosper from the technology, as well as which types of candidates and workers will be best suited for the technology. What are some examples of these forecasted trends and uses? In 2014, it’s predicted that employers will do away with quick fixes like Skype and opt for more potent video interviewing solutions like Spark Hire. The paper also reveals the online workforce is primed and ready for video interviewing to become the new norm. Why? There are currently about 34 million Americans who work at home at least occasionally. By 2016, virtual workers will consist of 43% of the American workforce. It’s not hard to imagine why companies will increasingly use video interviews to screen virtual candidates for cultural fit — there’s no travel required! Download the new whitepaper, “The 2014 Forecast for Video Interviewing”, from Spark Hire to learn more about what’s to come for video interviewing.